U-Pick Blueberries are Comin' Up! U-Pick blueberries will be here soon! We will start Thursday, June 25th. We will be open Thursday thru Saturdays, 9am to 4pm this year. Our commercial blueberries we started picking Friday which is crazy earlier than normal. We are all ready though so it is not a major stress. Plus it is so wonderful each time we get those blueberries off the bushes! We have a year's worth of time and money investment into those little things so the last few weeks can get a little stressful thinking of all the things that could go wrong right before you can get them picked. My daughter got to pick her first blueberry this year! At first she didn't seem to believe me that she could eat one. But after I popped one into my mouth, she couldn't stop eating them it seemed! 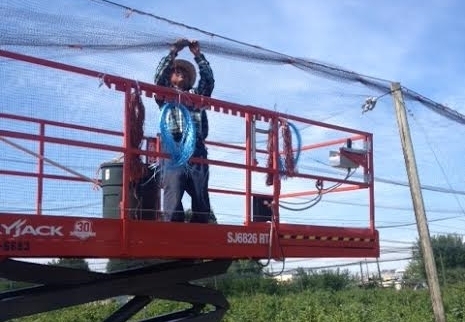 We also put our blueberry net up again for the year over 10 acres of berries. Each year we get a little better idea how to put it up faster. The u-pick apples are about the size of a golf ball right now! They are growing well, trying to get prepared for all you visitors in the fall! We are also growing Radish Seed, Kale Seed, Tall Fescue grass seed, and Corn this year. Our combine will be busy this year! Miss all the activity you guys bring when you come to pick our apples! But this year has flown by already so I know the fall will be here in no time. Hope you are enjoying the summer so far! I apologize for the layout of the words today. I'm having lots of trouble with the formatting lately. It seems like it has a mind of his own. But I wanted to get the information out to you! So what will we do all winter?? With apple season over with, things slow down a little here. Time to catch our breath and be thankful all our crops are in for the year. Then soon after, next year's planning starts. We look back over each crop we grew and brainstorm ways to make it go better next year , more efficient and try to learn from any mistakes. We also do a final tally of how the crops turned our financially to help make decisions. Then we sit down and figure out our "winter list", which is a list of things on our equipment that need fixed or improved. Then we think of capital purchases like tractors, more efficient blueberry sprinklers, add drip irrigation, irrigation pump repairs, sprayers, etc that we would need to improve the farm. To keep it moving forward instead of backwards. My dad is good about thinking long term and big picture. He likes to make a dream list if we had all the money in the world, what we would do. Then we whiddle it down to what can we actually afford and what is dire and most important for long term plus short term. For each crop there are many things to think about: Why are we growing this crop? Is it worth it to grow this crop- financially and time and effort? Do we have a rotation to keep this crop? Do we trust the people we grow for so we will get paid? What capital purchases in the future will we have to make to continue growing this crop? What is the future of the crop for price and demand. Etc, etc. Then we have to decide where we will grow each crop on the fields we have. It isn't the best to grow the same crop, year after year in the same spot. Corn can be grown 2 years in the same field but only if you have to because your yield goes down. Our vegetable seeds can't be grown again on the same land for 10-15 years because they can cross pollinate with weeds that maybe can't be controlled and the crop would be ruined. Some crops don't get harvested until later in the season, like corn, so there is too short of time before the rains start to plant fall planted crops, like grass seed. Anyway, my point is that you really have to do planning so you don't get yourself in a pickle. Besides all the planning, we also start in on pruning the blueberries and later in the winter, the apples. We also have to do mouse baiting in all the fields, so the voles won't eat our precious crop roots and trap for moles and gophers so our fields aren't destroyed. Sometime we need to apply lime to our apples and blueberries depending on the pH. We also attend LOTS of agricultural educational meetings. I have a picture of a mole we caught and I'm so tempted to post it on here but I don't want to gross anyone out :) So I will resist!